On May 11 the Bulgarian people honored the holy apostles and enlighters Cyril and Methodius. 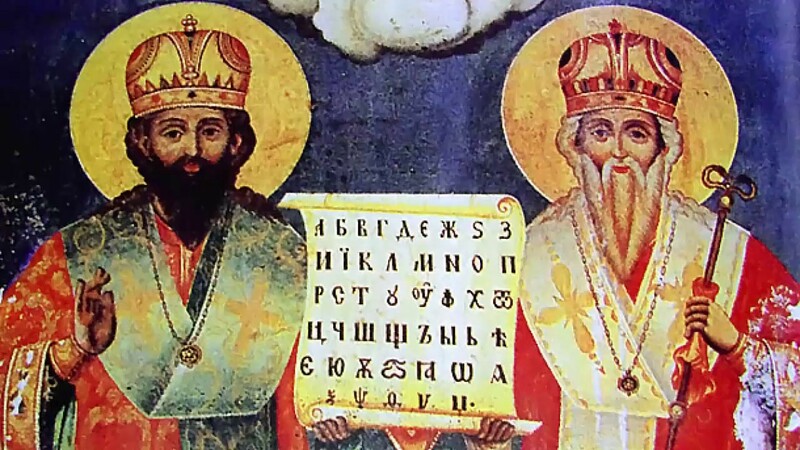 This day was established during the Renaissance as an important day of the Bulgarian festive system - a day of honor to the holy brothers Cyril and Methodius - creators and distributors of the first Slavic alphabet - the Glagolitic. On May 11 the Bulgarian people honored the holy apostles and enlighters Cyril and Methodius. This day was established during the Renaissance as an important day of the Bulgarian festive system - a day of honor to the holy brothers Cyril and Methodius - creators and distributors of the first Slavic alphabet - the Glagolitic. They are canonized as saints for the translation and popularization of the Bible in the Old Slavic language and for spreading Christianity among the Slavs. They have been proclaimed to be co-sponsers of Europe along with St. Benedict of Pope John Paul II. On 11 May, the day is celebrated by Kiril, Kirilka, Kiro, Kircho, Methodi and Methodi. The celebration of St. Cyril and Methodius, which is further developed as a specific Bulgarian phenomenon, marks the beginning of the Renaissance and connects with the school celebrations which were organized on 11 May when the Church celebrates the feast of the two holy brothers. The first announcements of the celebration of Cyril and Methodius on 11 May in our Renaissance literature are found in Neofit Rilski's 1852 Slavic Church. In 1857, the day of the holy brothers was honored in the Bulgarian church of St. Stephen in Constantinople, together with the service of St. Ivan Rilski. From the pages of the Tsarigradski newspaper of April 26, 1858, the awakening Eskisezar citizens learn that in Plovdiv and other cities the Bulgarians began to celebrate instead of "Three Saints" "St. Cyril and Methodius "as a school holiday. At the same time x. G. Slavov brings from Constantinople a "service ministry" for the holy brothers, compiled by archimandrite Neofit Rilski in Church Slavonic language. On May 11, 1858, this day was celebrated in Stara Zagora (Gossy Eski Zagra) on the idea of ​​the teacher PS Ivanov with "divine service" and exciting speech about the life and work of Cyril and Methodius. In the correspondence in the newspaper Tsarigradski, 382, 7 June 1858, read: "Here the Bulgarian teachers and educators adopted the patrons of all our small and big schools." Later one of the churches in the city - "St. Dimitar "obtains a second patronial name" St. St. Cyril and Methodius". Judging by the text that was preserved at the southern entrance, it happened no later than 1859. Since 1863, 11 May has been established as a church feast of the holy apostles Cyril and Methodius. After the Liberation, May 11 became a full-school holiday of Slavic first-time teachers. Then the idea of ​​anthem was born. In 1892 in Rousse, Stoyan Mihaylovsky, then a teacher at the Men's High School, wrote "Go People Revived". In May 1901, the teacher from the 5th grade Lovech School, Panayot Pipkov, wrote the music to the text. After the introduction of the Gregorian calendar in 1916, the celebration, celebrated by the State and the Church, is already celebrated in one day - only on May 24th. After 1969, an artificial secularization took place by separating the church from the secular calendar, so today we have two feasts - church (May 11) and secular (24 May). In the years of increased interest in our historical past and rediscovery of important moments connected with the periods of entry of the Bulgarian State, our natives give a worthy place to the role of the Slavic enlighteners for the cultural and historical development of Eastern Europe. Over a century ago, in 1980, this recognition would come from Pope John Paul II, who declared them the patrons of Europe. Today May 11th is celebrated as a church feast of the Holy Brothers, while May 24th is celebrated as a celebration of Bulgarian education and Slavic culture.